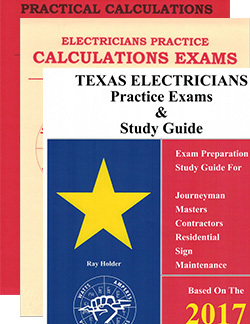 2017 TEXAS ELECTRICIANS PRACTICE EXAMS & STUDY GUIDE Based on the 2017 NEC®, this comprehensive self-study guide is specifically designed for licensing exams and National Electrical Code® review. It contains 18 practice exams of 25 questions each, and three final exams of 60 to 100 questions differing in length and difficulty, based upon the examination level. Each exam contains types of questions one will encounter on actual tests to identify your strength and weaknesses. This book covers all topics that are included on most journeyman, master, contractor, inspector, residential, sign, and maintenance licensing exams. Even with limited study time this kind of selective study yields maximum tests results. The text will familiarize you with the exam and enable practice in answer questions involving judgment, evaluation and reasoning.“ Answer key” with NEC® references included. 2017 ELECTRICIANS PRACTICE CALCULATIONS EXAMS This self-study exam prep book is based on the 2017 NEC® with ten practice calculations exams consisting of 25 questions each and a final exam of 100 questions. This calculations book covers most topics that are included on all journeyman and master electricians exams such as conductor sizing and protection, motors, transformers, voltage drop, demand loads, box and conduit sizing, over-current protection and residential and commercial load calculations. The text contains the most widely used electrical calculations and formulas the reader needs to pass the journeyman and master electrical competency exam. 2017 PRACTICAL CALCULATIONS FOR ELECTRICIANS This is THE book every electrician should own. This comprehensive electrical calculations textbook is based on the 2017 NEC® and contains complete coverage of core concepts of electrical calculations needed by every electrician. This book is arranged with topic-by-topic organization and step-by-step calculation procedures giving the electrician insight and understanding to solving mathematical problems. The text contains 10 main topic units filled with related information, with a Self-Assessment Quiz following each unit, as well as a 100 question final exam. The book will familiarize you with formulas and calculations for branch circuits, AC motors, voltage drop, power factor, conductors, boxes & raceways, appliances, dwellings, commercial occupancies, and many more topics. Whether for continuing education or exam preparation, this book is a MUST for every electrician.